Make no mistake about it. This book, It’s All About the Books: How to Create Bookrooms and Classroom Libraries That Inspire Readers, is about making sure that ALL students have access to books. 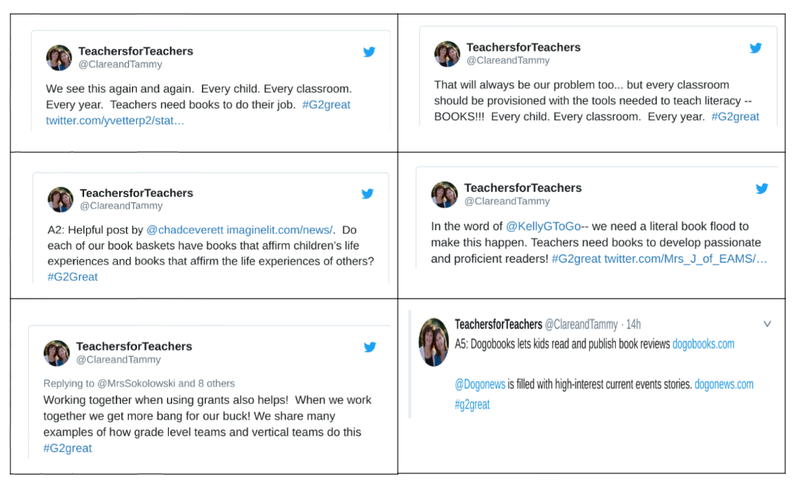 And our #G2Great chat with guest hosts Tammy Mulligan and Clare Landrigan was trending within seven minutes of the opening tweet on April 5th. The pace was fast, furious, filled with the famous (Kylene Beers, Laura Robb, and Penny Kittle to name a few), and packed with powerful learning. As participants, we were given guidance and flexibility through the talented wisdom of Tammy and Clare (and the experts that they base their work on) that would also allow us to insert our own vision and passion to meet the needs of students in our classrooms across the continent. Neither the chat nor the book is about meeting proficiency levels (although books are the appropriate tool) or choosing a set list of books (your student needs will vary), but were both focused on many critical aspects of developing book collections. This post will focus on just two of them: Access and Design. What does access to books mean for classroom libraries and bookroom collections? Every student deserves quality books that he or she can read in order to be a reader. Books are the tools of readers. Access to books cannot be left to chance. That means that within a school building every student needs access to a classroom library and probably some form of a collaborative collection in a bookroom in addition to the school library. When access to books is a priority, every first year teacher will walk into a classroom full of chairs, desks, and tables that also has a classroom library that is fully-stocked. The teachers and administrators understand and believe that when students read a lot – both texts they choose and can read – they will become lifelong readers, and that classroom library is an indicator of the strength of their belief. A final element of access will reflect that the collection will “grow and extend” with the students. The books that are the focus at the end of the year may be totally different from the books that were in the library on opening day. Some books will remain constant but many other books will be replaced as students outgrow themselves as readers and demand different topics and types of books as the school year evolves. What is the benefit for the students? What is the benefit for the teachers? Every teacher will have access to books necessary to meet the needs of their students. These books will match the purpose: whole group, small group (guided or strategy), partner, and independent reading as well as instructional needs: Read Alouds, writing mentors, science content and/or social studies content. 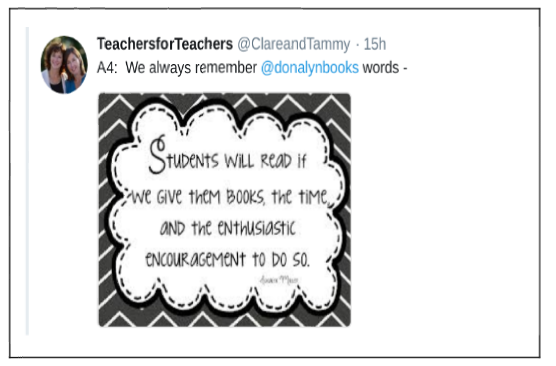 Access to quality books will enhance instruction and engage and inspire students. Access coupled with equity will mean that classroom collections will no longer be dependent upon teachers personally funding their own classroom libraries. In order to achieve this access, all teachers will be expected to work collaboratively to identify the existing inventory of books available in the building and then strategically plan for the best use. What does that mean? Perhaps there are six packs of guided reading books that are gathering dust in current guided reading libraries. Maybe they could be better utilized if they were inserted into classroom libraries or set up for book club usage or even independent reading. Specific gaps in types of books that students like and want to read can be addressed systemically after establishing priorities and developing an organized purchasing plan. Teachers with access to a wide range of books will be able to share their own passion, agency, and that sense of inquiry that exists in their own reading lives without the pressure of being personally responsible for provisioning every book the students read. Why is design important for classroom libraries and bookroom collections? Much has been written about book levels by such literacy giants as Fountas and Pinnell, Donalyn Miller, Kylene Beers, and our own Dr. Mary Howard. I love the phrase “Intent vs. Impact” that Tammy and Clare use in their book and in their podcast. Levels are instructional tools that are intended to be guides – not absolutes and definitely not to limit a student’s access to books. (But wait a minute, access was the last section!) Levels are not going to define a child’s reading so levels will not be the ORGANIZER for books which brings us back to design. Some questions to be answered are: How will books be organized? How will they be displayed? Which books? 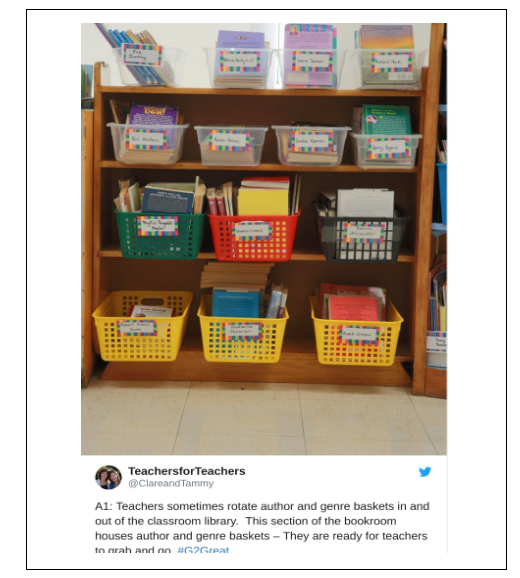 Taking book levels off of shelves and baskets does not meant that “anything goes” just as access doesn’t mean that students can only read a “Level H” for example. Middle ground means that book baskets can be organized by “concepts or ideas” such as “LOL” and the books in the LOL basket on the top shelf may be A-B, while the books in the LOL basket on the second shelf may be C-D, and the books in the LOL basket on the third shelf may be E-F. Students have access to any of the baskets but when they are choosing books that they can read independently, they can first decide on content: animals, friends, LOL, etc., and then check out the basket on the shelf that they are typically reading from. No one will ever say, “Now, Johnny, what level should you be reading?” Instead the conversation about books will be around the content and the strategies/skills/habits that the student uses as they tackle the books. Book levels will be inside the front cover or on the back cover, but they will not be the FIRST decision when choosing a book. Teachers will need to know the qualities of the levels, not to define students but to know just which book will be the next “ladder” for instruction, which will be a challenge or stretch, and which will be “just right”? This actually gives the teacher more flexibility because it is easier to drop a level or two for beginning work with a more difficult skill without causing student or parental panic. With practice students can quickly move through appropriate books for the WORK they are engaging in rather than the “But I’m supposed to be reading H books!” that often currently surfaces. Students can also be active participants in the book organization and the design of the classroom library so this means less work for the teacher. The classroom community can work together to create their own categories as they help curate the collection. Their “work” will also enable them to better appreciate the scope of the classroom collection. I’m always amazed when I’m in a classroom and students from another grade quietly step in, select a book from behind the teacher’s desk, and return to their own classroom. It’s important to know where those “book floods” exist that students actually have access to when they are in search of their next great book. 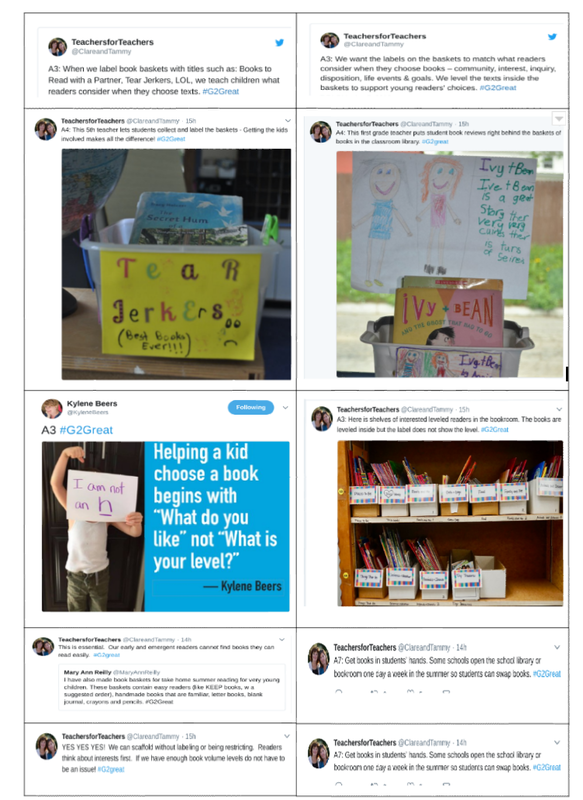 Shared teacher design is accomplished with the use of a bookroom or collaborative collection that helps provide the volume, range and choice that matches students’ interests. This collection exists to supply access to a world of ideas for students when they need them. Classroom libraries can easily be refreshed or rotated each quarter or each major school break so the teacher has a more ready supply of books available without a run on Amazon, Scholastic or other book sources. Sharing texts and especially series books makes provisioning libraries with authentic literature much more affordable. A five year purchasing plan, prioritized by gaps, can stretch farther than an individual teacher’s purchases. Books are the mainstay of student learning. Students gain such a feeling of accomplishment as they name that first book they can read or write. Literacy identities are important. This book, this chat, and the additional resources posted below literally add to our own passion for books, our “book love”, Reading is important because it improves our communication skills and enables us to learn about places and people that we may never see. It also helps build vocabulary and writing skills as we communicate better and even become better persons. 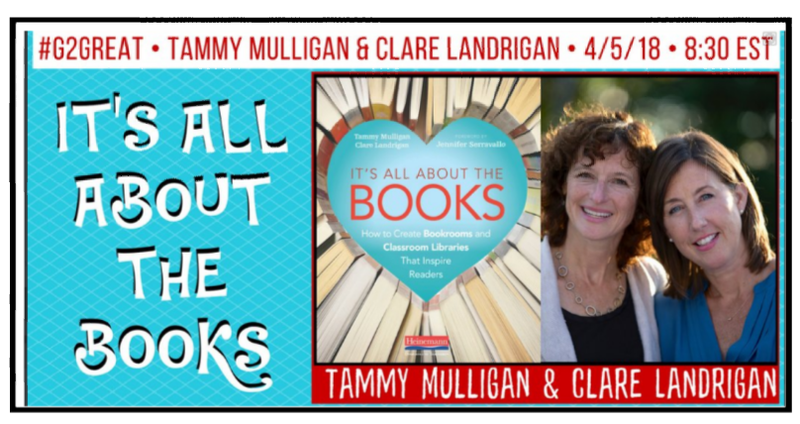 Books can help us with all of those skills and this book, It’s All About the Books, by Tammy and Clare can help us inventory, prioritize and develop a plan to further extend our budgets and ultimately our learning! This book gives you a proven process, with a ten year track record, that will help you maximize your resources for increased student and teacher access and design and organize all those resources in your classrooms and bookrooms. And if you already have Access and Design under control in your classroom libraries and bookrooms, there are many other chapters that deal with: Why a bookroom? Where to find diverse books? Technology? How are “Texts” defined? What about summer school access? Tammy and Clare will guide you through all the answers! !